This article is taken from the Oak View Community website: www.oakviewca.org. Mr. Watkins reminiscences are reproduced essentially verbatim (some spelling corrections) from a copy of an article found in The Sentinel. The Sentinel was an Oak View newspaper, published in the late 1950s and early 1960s. It appeared weekly on Thursday by Chuck and Faye Hill, with advertising by Joe Colville. The Oak View Sentinel, 1959. From Rocky Flats (Casitas Springs) north, the Ojai road followed the course of 399 to where it starts to run parallel to the railroad now. Then it crossed the tracks to stay close to it on the west ford of the San Antonio Creek. About where 399 leaves the railroad to go up the San Antonio Creek Valley. The old road then continued about parallel with the railroad on up the Ventura River Valley. A short distance from the ford, it crossed a private road going from the Hollingsworth Ranch House passing by La Crosse Station (near Casitas Springs) to fording the San Antonio Creek. It reached dry ground near where drying equipment was used in the processing of apricots. The apricot orchard was then south of the Hollingsworth home. A man named Meyers (I do not know if he spelled his name that way), rented the ranch from Jack Hollingsworth, father of James Hollingsworth who lives there now. The apricot orchard was later very nearly taken away by floods. The private road went on over the hill as does the Sulphur Mountain road now. On the left further on, where the road starts up the grade over Sulphur Mountain, was a small house with pens and some farm buildings. Here William (Bill) Foreman lived with his wife and small children. He had horses and wagons and hauled for others–hay, wood, etc. The place was known as “The Sheep Camp.” This private road was also used by a Mr. Jennings, who lived where the Rocky Mountain Drilling Co. has its yards. He owned the land from there to Ranch No. 1 (now the Willet Ranch) in the Arnaz area. Here lie the remains of oil well equipment at the first summit of Sulphur Mountain Road. However, the road at that time went up the canyon instead of over the present grade. About a half mile or less up the canyon, in 1900, a crew was drilling a well for oil with cable tools. The man in charge of this venture was a man named Van Epps, who in later years became well-known in oil well drilling circles. He was killed several years ago in an oil well explosion near Fillmore. The well, of course, did not produce. As the road to Nordhoff (Ojai) in 1900 passed La Crosse, (near Casitas Springs), it followed the railroad tracks to pass the home of Ed Goodyear, son of the man who owned part of the Arnaz Ranch at that time. Here the road split. The Nordhoff Road turned to cross the railroad to go up the San Antonio Creek Valley. The other road went straight up the Ventura River Valley. After passing the Goodyear home (built like so many of the houses that were here at that time) the traveler passes a large barn which was across highway 399 from the present Rancho Arnaz Cider Mill. West of it, the road wound up to the top of the hill to the farm land of Ed Goodyear (which now belongs to Henry Olivas). Mr. Goodyear was killed on this grade a few years later after being run over by a wagon loaded with corn. After passing the barn, the road passed some buildings of the Arnaz Ranch. The road then went past the old adobe house to again cross the San Antonio Creek. The road then proceeded up the Creek past a house which belonged to a many named Amesbury. He was, I think, one of the members of the crew who was drilling the oil well van Epps managed. This house, and the land which belonged to it was sometimes known as the Harmison Ranch. Alfalfa grew on this land. (It’s now known as the Littlefield Ranch). The road again leads to Ranch No. 1, with its No. 1 well flowing sulphur water. Beyond the barn and shop stood the house Tom Bard built to house and feed the men associated with him in drilling California’s first drilled oil well. Across the Creek was the Arnaz School (Oak View’s first school), which was built in 1883 and is still standing. (It is now occupied by the N. Amescua’s). Not far from this point, the road forked and the Creek Road continued on up the San Antonio Creek Valley. And the other one went up the old grade to what is now the central part of Oak View. At this point was a row of mail boxes which marked the end of the Ventura Star Route. An old-fashioned steel-perforated sign indicated the distance to Ventura and to Nordhoff by both routes. A US Geodetic Survey marker stood at this point. The Grade Road forded the San Antonio Creek where it immediately passed the house on the Harter ranch. A Mr. Alex Wiltfong lived in this house, which I believe still stands. Mr. Harter, owner of the ranch, lived in a small house nearby. At this point a private road went up the canyon to get to the farm land of the ranch. This land is now owned by Judge David Drapeau, Margaret Bertles, the Mangans and others. I think this included the land on the south of Sunset St. This part of the ranch was planted in plum trees. Leaving the Harter house, the Grade Road climbed steeply and roughly to where Dr. Clow now lives. At practically the same point where the road to the Clow’s house leaves the Old Grade Road, there was a private road leading to the Arellanes Ranch. At the entrance was a barbed-wire gate with a sign on it: “THIS 40 ACRES FOR SALE–$30.00 PER ACRE.” On a hill back of Wood’s Nursery was a small house of typical design. This house was vacant from 1900 to about 1915. Then a man named Garman repaired it to make it livable. By that time Nidever had bought the ranch and planted an apricot orchard. Garman rented it and farmed on shares. Mr. Garman attempted to get around the expensive practice of pitting the apricots before they were laid out to dry. He built a huge machine to cut the fruit, and women were hired to spread the apricots. He took out patents on his machine and was working on improving it at the time of his death. Hay and barley were also grown on this ranch. We called the ranch, “the Canstancia Ranch.” I think it should have been Cagnacci. The Mesa, (Oak View Proper) in 1900 was, with its deserted homes, neglected yards, and half-farmed acres, an example of good deal of the earths history. It told of the broken hopes the unfilled dreams, unrewarded ambitions, and labor of people long gone from this region. Poor crops at times and low prices for abundant crops at other were factors that, coupled with the lack of water, finally drove the sturdy people to the more favorable areas. North of the Harry Wood Nursery (on Portal St. in Oak View) was a building that people called the Soso or Sosa) house. I remember there were a number of old worn-out Ã’Walter A. WoodsÃ“ mowing machines standing nearby. West of this building, which I think had been a barn converted to a house, was a big cactus thicket which bore large yellow fruit. It was of the semi-thornless variety, introduced by Luther Burbank. From that point, the road to Ojai climbed further to the entrance of the Staire Ranch. Dr. Staire (a dentist) and his brother were partners in this ranch. W Lee Ferguson, who tended the Staire orchards, lived in a house near what is now Courtney Richards Chicken Farm. South of this point was located a unique stone building built many years before, of lime shale slabs held with plaster. These slabs were fairly abundant along the old grade. The building was used for storage. It was probably occupied by one of the Mexican families before California came into the hands of the Americans. Mr. Ferguson was the found of the Cider Mill, and was the man who planted the apple orchard on Rancho Arnaz. He married Fannie, the daughter of Mr. Goodyear (Father of Ed Goodyear mentioned earlier in this series ) who had always resided at Rancho Arnaz with her father. Mr. Goodyear deeded most of the property to his children, but Rancho Arnaz was once more restored when Mr. Ferguson bought up the land from these children. Ferguson also acquired the Armsbury Place and a large part of the apple orchards are a remnant of that property. Mr. Goodyear lived a long life, cared for nicely by the Fergusons. Though they had no children, Mr. and Mrs. Ferguson lived long and happily together. South of Oak View, after leaving Rancho Arnaz, the Grade road went north to the Staire Ranch, with its barn & drying equipment visible on the right of the road. Nearby stood a two-vat prune dipper, apricot pitting shed, tracks with fruit cars, permanent smudge houses and a dry ground. These occupied the land on which the home of Mr. Springer is located. There was only a hay field where Courtney Richards, has his chicken ranch, 410 Old Grade Rd. Nearly half of the land of the Staire Ranch was devoted to prunes, about half to apricots, the rest to olives. North of the drying plant, just about where Walt Shiernbeck lives, (139 E. Oak View Ave.) stood a building used to store dried fruit. This belonged to a Ventura banker named Walker, (I believe he was the father of Harley Walker, who was once the president of the Union National Bank). This ranch was planted to prunes mostly. Hay was grown along the lower end near the railroad tracks, and near the fruit house, east of the road and south of where the Gardens Water Co tanks now stand. This ranch was crossed by the road. The Mahoney family house was vacant and run-down in 1900. However, a good fence and shade trees surrounded the house even though the yard had gone into ruin. A cistern south of the house and a galvanized iron tank west of the barn were used to store rain water. In passing, note that the Walker place to the south (mentioned earlier) was later subdivided and became known as Oak View Gardens No. 1. And the Mahoney Ranch, as it became known, was called Oak View Gardens No. 2. Oak View was the name given to the railroad station and siding as it passed the Mahoney Ranch. These stations were erected about every two miles between Ventura and Nordhoff (Ojai). Back of the Oak View station was a prune drying plant with a typical two vat dipper. Also behind the station was a reservoir built by Mr. Sherwood. The reservoir was never lined even though he had intended to pump water from a well in the river bottom. A projected public road had been laid out (and partly graded) from the Oak View Station to the Ventura to Nordhoff road along the north line of the ranch. It was thought at the time that this road would be used to transport local products to the railroad station. In what is now the north section of Oak View, William Collins, an early day Ventura banker, owned the ranch across from the Hemus place. 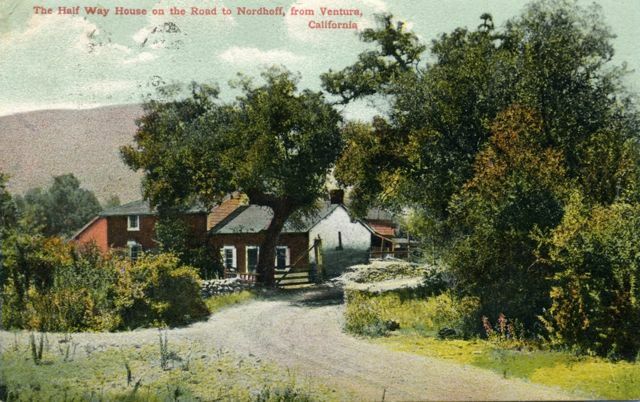 The drive to the Collins house started where Shamrock Inn (near Ojai Drive) now is located. In 1900 the area north of the drive was planted to pears and apples. The trees were old, but a few trees yet remained of an orchard that predated the pears and the apples. South of the drive, the hill had been planted to apricots. A huge pear tree stood north of the drive at the gate; and a few years ago, this tree almost surround the Inn. Much later, the drive was changed to make room for the building now there. A big red barn stood on the hill east of the drive after it changed to a southward course at the top of the hill. South of the barn was a house owned by a Dr. Miller, a dentist. It was a straight up-and-down board house as usual, but it had what I presume is called a hip roof. Two brothers by the name of Warren owned the Miller Ranch and, I believe, the Sherwood Ranch at the time. One brother had a home east and south of where the Shamrock Inn stands. The other brother had a house near where Best Tire Shop (on Vent. Ave and Ojai Dr.) is located. Both houses were vacant after the Warrens moved out, but beautiful roses bloomed in the yard each year. Ivy was trained over eastern portions of both homes. Moonflower vines, Boston ivy and a vine called (by old timers), Potato Vine, grew over the Miller house. The house had no shade trees. In 1900, the only occupied home in Oak View proper was the Staire House on Old Creek Road mentioned previously). Our family moved into the Miller house in 1901. That made two occupied houses in Oak View. At a point a little north of the entrance of Oak Dell Park ( in north Oak View ), the Nordhoff road went up a steep grade and came down on the side about due east of where Dr. John Munger (in Santa Ana Vista) now lives. Standing just south of the entrance to the Oak Dell Park, one can look back over the area traversed by the Old Grade Road. You can see far to the south the land that was owned by Ed Goodyear (which Henry Clivas now owns). This land was known as “The Mesa.” Some of the people called it “Hard Scrabble.” The soil is poor and shallow. Hard pan lies under almost all of it from a depth of a few inches to several feet. It is stony, and, in those days, without water. The Livingston house was due west of where the Ventura River Municipal Water District buiding now stands. Only a hayfield surrounded the house, no other buildings of garden. It was of the typical up and down board construction of its day, and it was in poor condition. The Feraud Ranch produced hay and had a small vineyard (wine grapes) and an apricot orchard on the part south of Devil’s Gulch. There were a few English walnut trees among the apricots. part of the ranch extended into what is now known as Linda Vista Knolls. Dr. Staire dug by hand numerous wells in the barranca that passes the post office building. All these attempts were failures. There had been attempts on the Walker Place and the Miller Ranch to dig wells by pick and shovel. Sherwood made several tries. One across the canyon from the school house lacked but a few feet of reaching water. Mr. Mahon afterwards drilled in the old hand dug well to get a fair well. However, in seven years it dried up. Dr. Staire had a good spring near the railroad tracks from which he hauled water. Most people, however, hauled water from Ventura River or San Antonio Creek in barrels or tanks. Looking south from the north end of the “Mesa” (Oak View proper) Red Mountain appears as a back drop for the southern end. The south end of the mesa (now owned by Henry Olivas) was owned by Ed Goodyear, son of the man who owned the old Arnaz Adobe with a portion of Rancho Arnaz as late as 1900. This ranch stretched (I believe) from the Ventura River on the west to at least the edge of the bluff overlooking San Antonio Creek on the east. And it extended from the north line of land belonging to his brother John (on the south) to land belonging to the Kennedy’s on the north. J. Logan Kennedy and his wife Netta had this second parcel of land on the Mesa of about thirty acres. This thirty acres was farm land, in addition to pasture land. I think it reached from the edge of the bluff overlooking Ventura River to the San Antonio Creek. Some of their land was east of the creek. North of the Kennedy property, was land owned by a Mr. Harter, an elderly man whom I believe was from Florida. He and his wife lived on this ranch. So much for the area of Oak View proper. The old grade road north of Oak View ran parallel to the railroad tracks at the Feraud house in what is now Santa Ana Vista. The Feraud house was more modern than most of the houses in this area. It has been improved and additions have been made to it, but the old building is still there. On the Feraud property, there was a small amount of water from shallow wells beside the railroad tracks. Some hay and apricots were grown on this part of the ranch north of Devils Gulch. Mr. Feraud, I believe, tried to get a well in the river bed. He dug by hand, but his efforts failed. The land owned by Judge Brown, reaching from the San Antonio Creek to the Grade Road, now belongs to Mr. B. E. McCormick, a resident of Ventura. Only a short distance marks its frontage on Highway 399 from where the new pipe line of V.R.M.W.D. crosses the road at Santa Ana Vista by the road that leads to Skyline Estates. Stevens Land Co. of Los Angeles owned the land which now covers part of Mira Monte, Midway Acres, and land to the Krotona Institute property, and part of the Ventura River bottom to Meiners Ranch (now Meiners Oaks). An abandoned home stood across the railroad tracks from the location of the Mira Monte School. The ranch north of the Feraud property (mentioned last week) belonged to a Mrs. Barrett. She had two children. Louie was the older, was married and had two children. Charles attended the Arnaz School with his cousin Naude Jackson who lived with the family. I lived in Ojai as a child. It is always in my heart. I am looking for info on the old Shamrock Inn. My mother has told me her uncles Johnny and Clinton Smith played music there in the 40’s. Probably Bluegrass with fiddle,mandolin and guitar. Where would i find more info on the Shamrock?